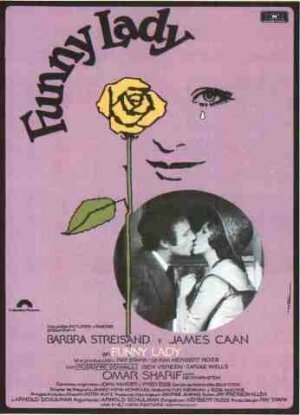 Recrea la vida de la actriz y cantante Fanny Brice. Una historia de amor marcada por un pasado. Ben Vereen, Raymond Guth, Ken Sansom, Larry Gates, Samantha Huffaker, Royce Wallace, Heidi O'Rourke, Don Torres, Barbra Streisand, Corey Fischer, Joshua Shelley, Carole Wells, Eugene Troobnick, Roddy McDowall, James Caan, Matt Emery, Colleen Camp, Byron Webster, Garrett Lewis, Omar Sharif, Lilyan Chauvin, Cliff Norton. Herbert Ross (Dirección), James Wong Howe (Montaje), Jay Presson Allen, Arnold Schulman (Guión), John Kander, Fred Ebb, Peter Matz (Música).